The U.S. energy sphere has seen a drastic transformation as renewable energy and energy efficiency have become the cleanest and cheapest resources, and NRDC’s Sixth Annual Energy Report published today shows that powerful trend continues. America’s Climate Crossroads: Pushing Clean Energy Higher & Faster explores the last year and a half of U.S. energy trends and news, highlighting emerging opportunities—and roadblocks—on the path to a safer climate future. It comes less than three weeks after the Intergovernmental Panel on Climate Change warned of perilous worldwide impacts if we do not act quickly to limit global warming. Our new report shows that 2017 was another year of significant clean energy progress: cities, states, and businesses continued to press forward on clean energy and climate action—driving power-related emissions to 30-year lows and establishing cutting-edge standards and policies that promise to push the envelope on what renewable and efficient technologies can do, all while electricity expenses (as a percent of household income) fell to record lows. While there were many positive moments, much more must be done to ensure that the clean energy transition continues—and that it spreads worldwide fast enough to avoid the most dangerous effects of climate change. The United States is at a pivotal crossroads: Do we move full speed ahead toward an energy system that prioritizes clean resources, building upon extraordinary progress, or do we fight the tide of innovation and economics to save the inflexible, riskier, centralized system of our past? U.S. energy-related carbon dioxide (CO2) emissions continued to fall in 2017—marking the third consecutive year to see a total reduction in carbon pollution—and reaching 14 percent below 2005 emissions. This is the lowest level since 1992. Much of this decline was driven by the power sector, which has seen plunging emissions as new renewables, energy storage, energy efficiency, and gas-fired generation have displaced aging, uneconomic coal plants. Power emissions declined by more than 4 percent in 2017 alone and by 28 percent since 2005—putting the sector within reach of the Obama administration’s Clean Power Plan’s 2030 pollution reduction targets 13 years early. Despite movement in the right direction, the United States is off track from our climate commitments, as this chart shows. Under the Trump-proposed federal power plan and vehicle fuel efficiency rollbacks, we would emit 857 million tons of CO2 per year above our nation’s Paris Accord target in 2025 and about 1.8 billion tons above levels implied by a 1.5-degree climate-warming scenario. However, we can meet our climate commitments with the clean energy tools already available to us. 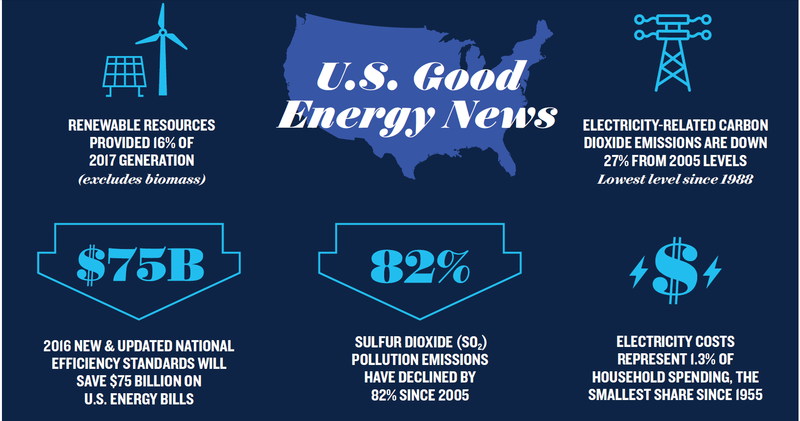 NRDC’s report, America’s Clean Energy Frontier, laid out a clean pathway to help the United States avert the worst impacts of climate change. Our newest report shows the nation already has achieved much greater change than imagined possible just a decade ago—and now we must push further and faster to avoid the worst effects of climate change. Here’s a summary of the biggest clean energy advancements of the last year and a half, and a look at how the U.S. must build off this success and what each person can do to make climate action a reality. More EVs sold than ever before—and now more than 1 million on U.S. roads. 12 northeast and mid-Atlantic states (+ plus DC) announced an historic plan to cap carbon pollution from vehicles across the entire region. The price of lithium ion battery packs has decreased by almost 80 percent from 2010 to 2017, helping make solar power plus storage an economic reality across the Western U.S.
Continue electrifying not only our cars, but also buses and trucks. In NRDC’s climate action strategy, electric vehicles make up about 75 percent of all cars on the road—up from just 0.5 percent of cars today. Encourage automakers to make more efficient vehicles; the federal government’s attempt to roll back fuel economy standards sends us backward. In NRDC’s proposed climate action strategy, the average fuel economy of a new car rises four-fold by 2050. With transportation now the largest carbon emitter, we must address its tailpipe pollution head on. When possible, curb your personal mileage. Consider alternatives to solo car travel—like carpooling, public transit (if available), walking, or biking. When you need a new car, choose more efficient and clean cars, like hybrids or electric vehicles. States made significant pledges to cut energy waste: New Jersey agreed to more than triple energy savings, New York to more than double them, and Virginia to triple utility-based efficiency spending. Vermont and California passed state-of-the-art standards for many consumer appliances and new homes, respectively. These expenditures, plus previous years’ investments still working today, reduced U.S. electricity demand by 6.5 percent in 2017—or almost California’s entire annual consumption. Efficiency gains have been slowing globally in the last few years: we need to flip this trend. NRDC’s climate strategy requires the U.S. to take aggressive, but achievable, action on efficiency ASAP. We need tougher appliance standards, building codes, industrial efficiency programs, and personal energy-saving efforts to achieve an annual 1.5 percent reduction in U.S. energy use above “business-as-usual” efficiency gains. More than 60 percent of all raw energy in the U.S. is wasted every year—and each of us can cut energy waste from our lives. Turn off lights and electronics when not using them—and unplug electronics you use rarely or when you travel, switch your bulbs to LEDs, and when shopping for a new appliance, buy an efficient version (like ENERGY STAR®). Check your local utility’s website to take advantage of its efficiency programs, which often offer rebates or at-the-till discounts on an assortment of energy efficient products. Renewables now account for 16 percent of U.S. power, with total renewable generation growing almost 10 percent from just 2016. During the spring, renewables are providing more power than nuclear plants. With more renewables powering our economy, we used less fossil fuel to produce electricity than we did in 1994. Coal use has dropped to 1982 levels. To hit a “net-zero” emissions target by 2050, our electricity mix must be near- or zero-carbon. This means far more renewable energy—like wind and solar—which grows to 80 percent of our electricity mix by 2050 in NRDC’s climate strategy. Utilities and cities are offering new clean energy options. Look to see if your utility offers a 100 percent renewable energy option or if your city has committed to 100 percent clean energy. If you own your home, consider installing rooftop solar panels. Many states and utilities offer incentives, and there is a federal tax credit for solar installations. For renters and apartment dwellers, check for community solar offerings, which allow everyone to participate in the benefits of solar generation. The report also digs into 2017 developments for coal, nuclear, natural gas, and oil. This includes attempts by the Trump Administration to prop up uneconomic and dirty power plants and roll back federal standards that encourage companies to develop more efficient appliance and vehicles that save Americans money at the pump and on their utility bills. These obstacles threaten not only our climate and health, but the checkbooks of U.S. households and businesses. The U.S. energy system has seen a transformation in the last decade: energy spending is down, clean energy is up—and the ever-improving economics of clean energy will only drive further change. Clean energy is not only cheaper, it is our best weapon against climate change. To learn more, take a look.